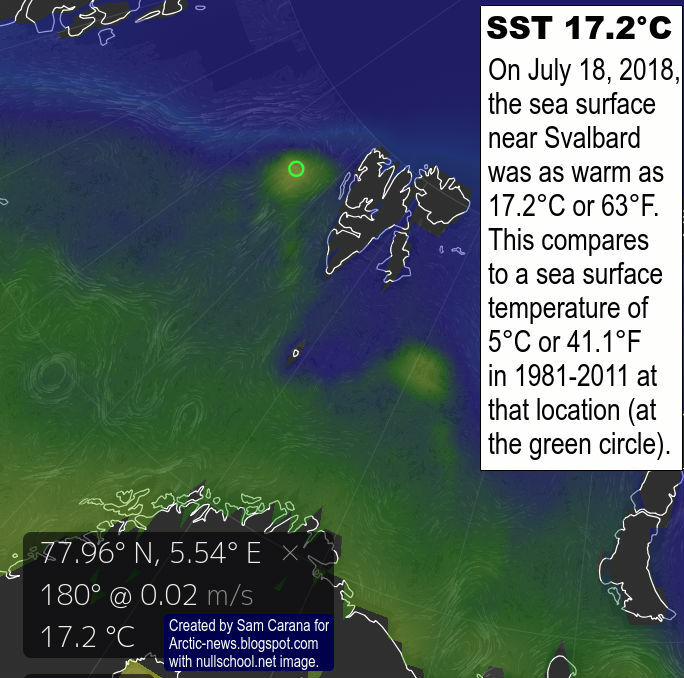 The image on the right shows sea surface temperatures on July 6 for the years 2014 to 2018 at a location near Svalbard (at 77.958°N, 5.545°E), with an exponential trend added based on the data. The situation reflects the rapid decline of Arctic sea ice over the years and constitutes a stark warning of imminent sea ice collapse and its consequences for the world at large. 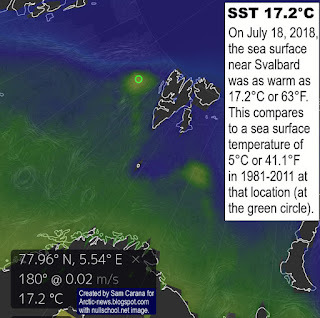 The image on the right shows the sea surface temperature on July 18, 2018, at that location. It was as warm as 17.2°C or 63°F near Svalbard. This compares to a sea surface temperature of 5°C or 41.1°F in 1981-2011 at that location (at the green circle). For more background on the warm water near Svalbard, also see the earlier post Accelerating Warming of the Arctic Ocean. The images illustrate why sea ice has fallen dramatically in volume, especially so where sea currents push warm water from the Atlantic Ocean underneath the sea ice. The decline of Arctic sea ice volume over the years is illustrated by the Jim Pettit graph below. 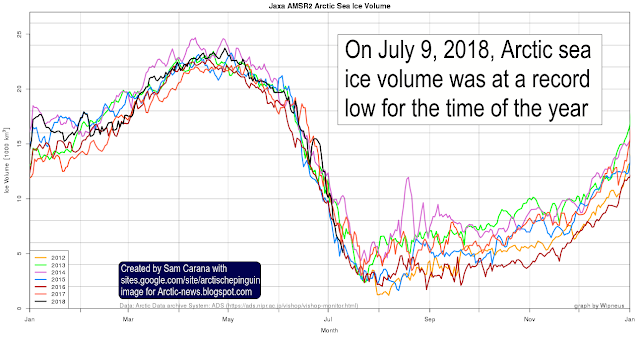 As the Wipneus image below shows, Arctic sea ice volume on July 9, 2018, was at a record low for the time of the year. The animation on the right shows a fall in volume of some 1 meter over most of the sea ice, over the period from June 21 through July 12, 2018, with a further eight days of forecasts added. The animation illustrates the huge amount of melting taking place from underneath, due to an inflow of heat from the Atlantic Ocean and the Pacific Ocean, and from warm water from rivers that end in the Arctic Ocean. 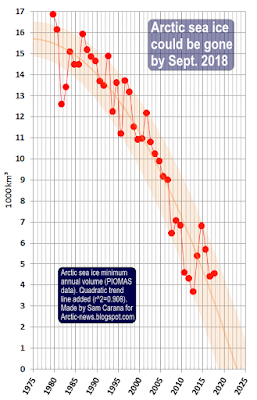 Meanwhile, sea ice extent doesn't fall very much at all. When only looking at sea ice extent, the dramatic fall in sea ice volume may be overlooked. 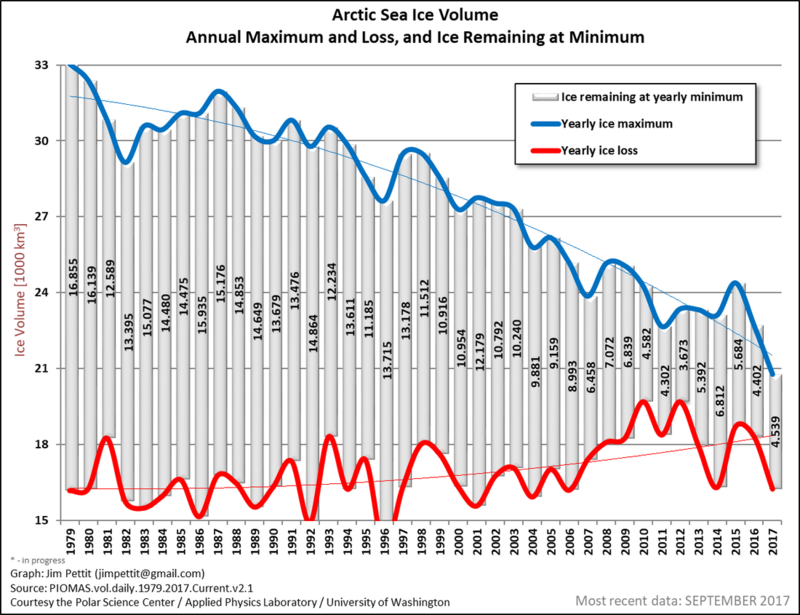 Complete disappearance of Arctic sea ice in September 2018 is within the margins of a trend based on yearly annual minimum volume, as illustrated by the image on the right. Latent heat can make such disappearance come abruptly and - for people who only look at changes in extent - rather unexpectedly. Latent heat is energy associated with a phase change, such as the energy absorbed by solid ice when it changes into water (melting). During a phase change, the temperature remains constant. Sea ice acts as a buffer that absorbs heat, while keeping the temperature at zero degrees Celsius. As long as there is sea ice in the water, this sea ice will keep absorbing heat, so the temperature doesn't rise at the sea surface. Oceans take up over 90% of global warming, as illustrated by the image below. Ocean currents make that huge amounts of this heat keep entering the Arctic Ocean from the Pacific Ocean and the Atlantic Ocean. 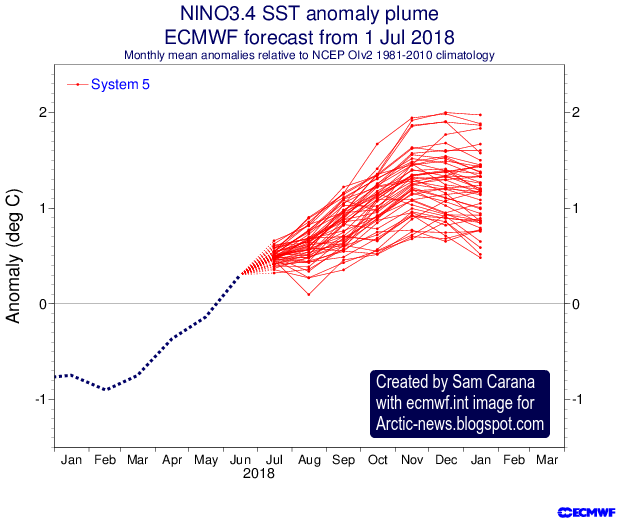 Once the sea ice is gone, further ocean heat must go elsewhere, i.e. it will typically raise the temperature of the water. The atmosphere will also warm up faster. 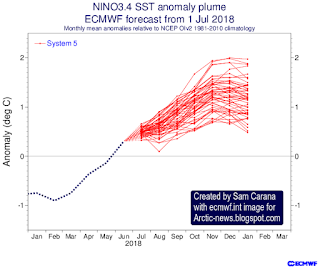 More evaporation will also occur once the sea ice is gone, which will cool the sea surface and warm up the atmosphere (technically know as latent heat of vaporization). As temperatures in the Arctic are rising faster than at the Equator, the Jet Stream will change, making it easier for warm air to enter the Arctic. More clouds will form over the Arctic, which will reflect more sunlight into space, but which will also make that less outward IR radiation can escape into space over the Arctic, with a net warming effect. Meanwhile, El Niño is getting stronger, as illustrated by above image on the right. A warmer Arctic comes with stronger heat waves, forest fires and associated emissions, and rapid warming of water in rivers that end in the Arctic Ocean, all of which will further warm up the Arctic Ocean. Forest fires have already been burning strongly in Siberia over the past few months and methane recently reached levels as high as 2817 ppb (on July 8, 2018, pm). One huge danger is that, as the buffer disappears that until now has consumed huge amounts of ocean heat, and the Arctic Ocean keeps warming, further heat will reach methane hydrates at the seafloor of the Arctic Ocean, causing them to get destabilized and release methane. 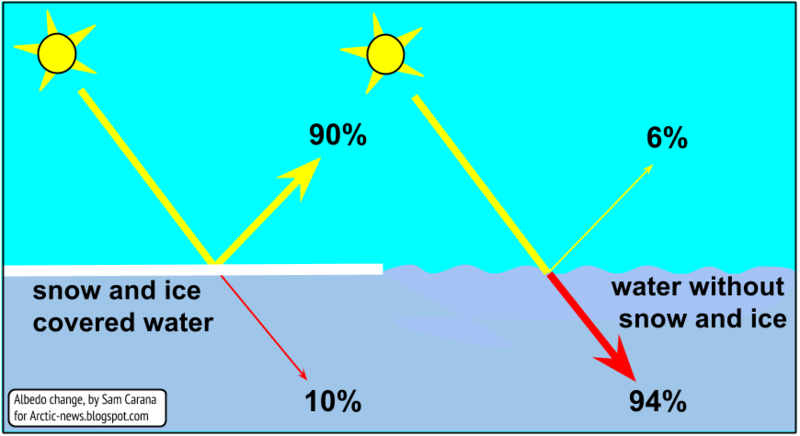 Additionally, disappearance of the sea ice will come with albedo changes that mean that a lot more sunlight will be absorbed, instead of getting reflected back into space as occurred previously. 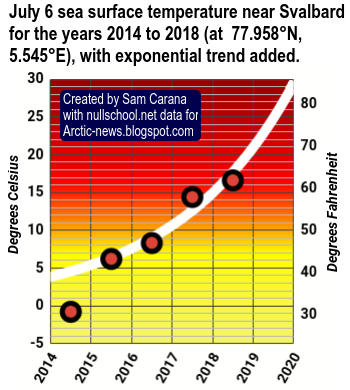 Similar albedo changes are likely to take place over land in the Arctic soon thereafter. Adding up all warming elements associated with disappearance of the sea ice can result in an additional global warming of several degrees Celsius. An excellent new paper by Mark Jacobson et al. describes 100% clean and renewable Wind, Water, and Sunlight (WWS) all-sector energy roadmaps for 53 towns and cities in North America. In the video below, Mark Jacobson discusses the 'Path to a 100% Renewable World'. Clean and renewable energy is not only cheaper, it also avoids health and climate damage many times greater than those savings. Additionally, clean and renewable energy provides more long-term full-time jobs, provides more robust and stable energy and provides greater energy safety and security, all with less need for land and water. Furthermore, clean and renewable energy avoids costs of insurance against nuclear accidents, avoids conflicts over fossil fuel resources, avoids pollution of oceans, soil and groundwater and avoids infrastructure for transport of drilling & mining equipment and fuel. Reductions in mining, drilling and fracking can also avoid falls in land values, with benefits for land owners and for councils in terms of greater rates revenues. As described in the earlier post 100% clean, renewable energy is cheaper, the price of fuel looks set to go up over time due to decreasing economies of scale for fuel, while the price of clean, renewable energy looks set to keep coming down, in line with ongoing innovation, efficiency improvements and economies of scale. Examples are induction cooking, batteries, heat pumps, LED lights, refrigeration and smelters. The transition to clean & renewable energy will avoid a lot of energy, time and money spent on planning, constructing and maintaining the ports, railways, pipelines and supply of water for cooling that is needed to keep conventional power plants going. The savings in efficiency are huge, as illustrated by the image below, the total demand reduction is 57.9% of what the demand would be if business were to continue as usual (BAU). Many of the costs associated with fossil fuel are currently not incorporated in its price. Continued emissions would drive the world further in debt, due to rising costs of health care, removal of carbon dioxide, etc. There is also the price of conflict. As an example, fossil fuel adds to the cost of conflict over resources and securing of fuel transport. A 2017 report puts the cost of U.S. military intervention in Syria, Iraq, Afghanistan, and Pakistan over the period FY2001-FY2018 at $5.6 trillion, or $23,386 for the average taxpayer. The report adds that, unlike past US wars, these wars have been paid for largely through borrowing. The $5.6 trillion includes the interest the US has already paid on this debt, but it does not include projected future interest. Even if the US stopped spending money on these wars right now, cumulated interest costs on borrowing will ultimately add more than $7.9 trillion to the national debt over the next several decades. Sam Carana's Climate Plan suggests that local feebates can most effectively and rapidly achieve the necessary transition to clean & renewable energy. As an example, fees can be imposed on sales of fuel, with the revenues used to fund rebates on local supply of clean & renewable energy. Another example is to impose fees on registration of vehicles with internal combustion engines, with the revenues used to fund rebates on registration of battery-electric or hydrogen-powered vehicles. Local feebates can best help areas each get their preferred mix (of local supply/storage, of grid interconnection and imports/exports of electricity, and of demand response). The Climate Plan calls for dramatic cuts in emissions through such policies, while also calling for further lines of action. For more on the benefits of feebates, see the feebates and policies pages. 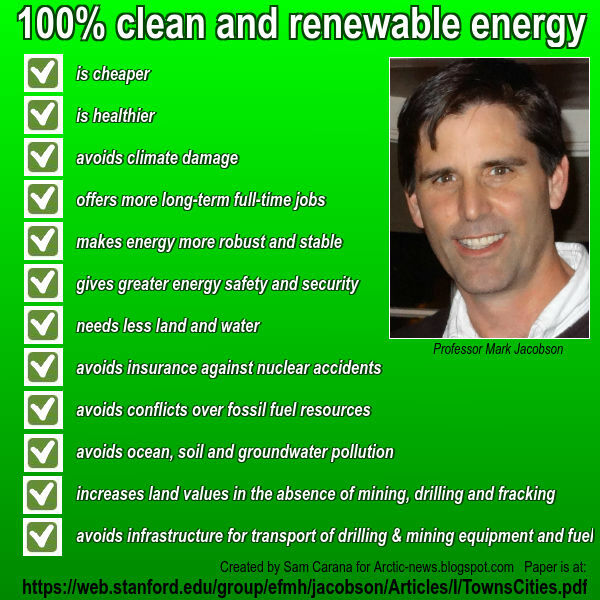 • 100% clean and renewable Wind, Water, and Sunlight (WWS) all-sector energy roadmaps for 53 towns and cities in North America, by Mark Jacobson et al. • 100% Clean and Renewable Wind, Water, and Sunlight All-Sector Energy Roadmaps for 139 Countries of the World, by Mark Jacobson et al. 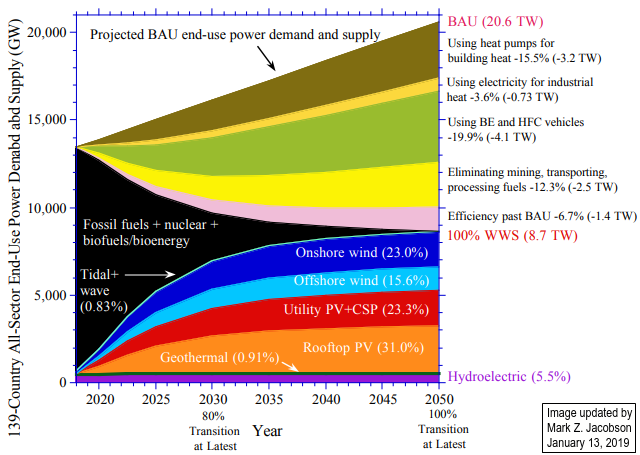 • Matching demand with supply at low cost in 139 countries among 20 world regions with 100% intermittent wind, water, and sunlight (WWS) for all purposes, by Mark Jacobson et al. Can we weather the Danger Zone? As an earlier Arctic-news analysis shows, Earth may have long crossed the 1.5°C guardrail set at the Paris Agreement. 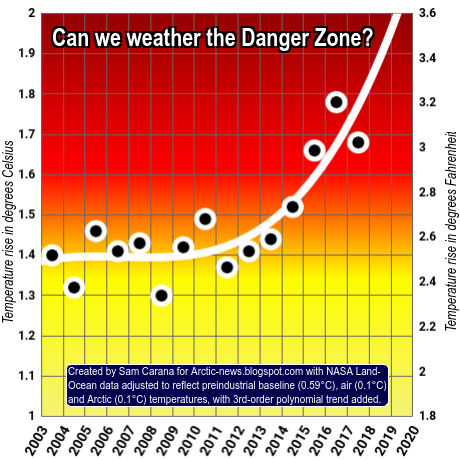 Earth may have already been in the Danger Zone since early 2014. This is shown by the image on the right associated with the analysis, which is based on NASA data that are adjusted to reflect a preindustrial baseline, air temperatures and Arctic temperatures. As the added 3rd-order polynomial trend shows, the world may also be crossing the higher 2°C guardrail later this year, while temperatures threaten to keep rising dramatically beyond that point. 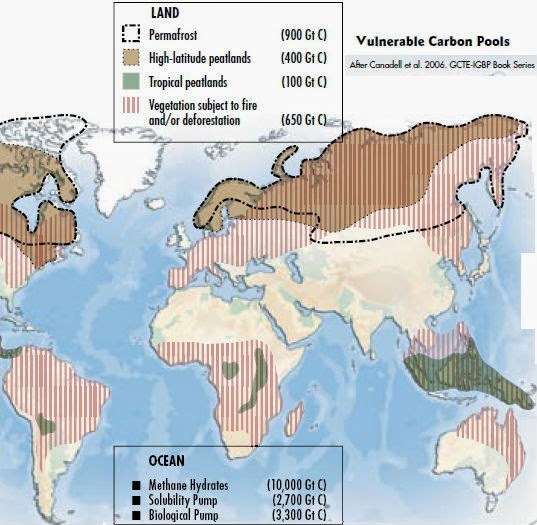 As described at the Threat, much carbon is stored in large and vulnerable pools that have until now been kept stable by low temperatures. The threat is that rapid temperature rise will hit vulnerable carbon pools hard, making them release huge amounts of greenhouse gases, further contributing to the acceleration of the temperature rise. Further release of greenhouse gases will obviously further speed up warming. In addition, there are further warming elements that could result in very rapid acceleration of the temperature rise, as discussed at the Extinction page. Below are some images illustrating just how dire the situation is, illustrating how vulnerable carbon pools are getting hit exactly as feared they would be with a further rise in temperature. On July 5, 2018, it was as hot as 33.5°C or 92.3°F on the coast of the Arctic Ocean in Siberia (at top green circle, at 72.50°N). 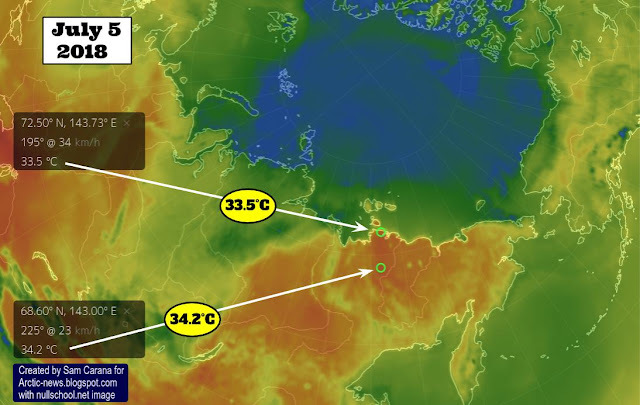 Further inland, it was as hot as 34.2°C or 93.5°F (at bottom green circle, at 68.6°N). 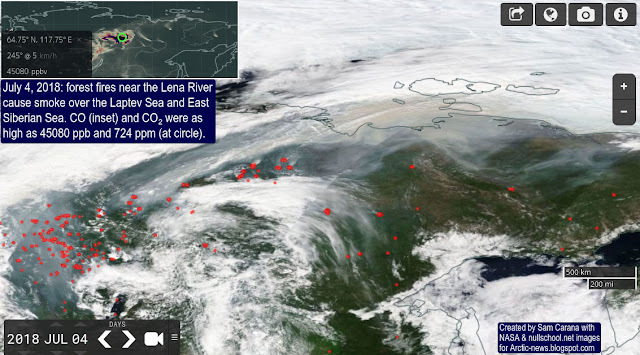 The satellite image below shows smoke from fires over parts of Siberia hit strongly by heat waves. 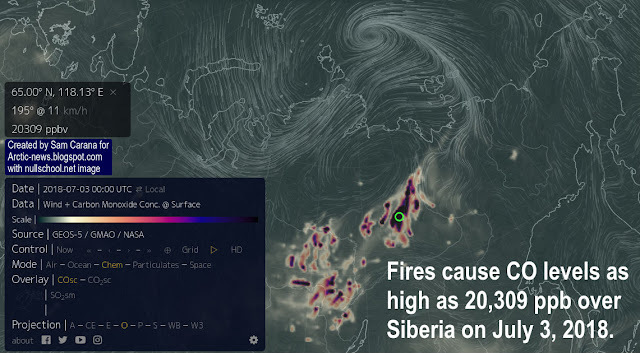 The fires caused carbon monoxide levels as high as 20,309 ppb over Siberia on July 3, 2018. 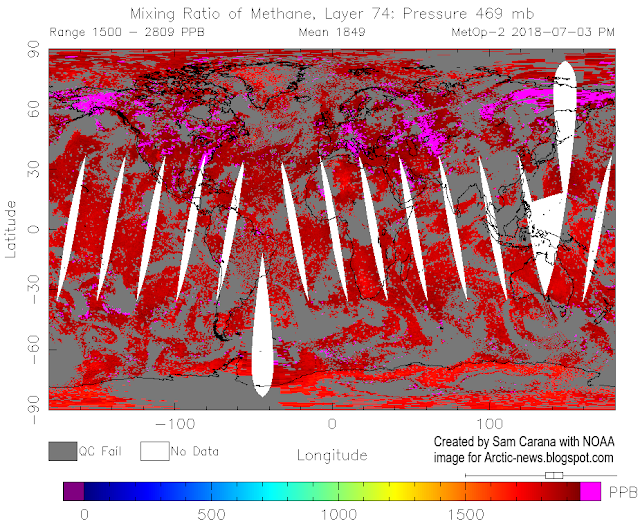 Methane levels that day were as high as 2,809 ppb. On July 4, 2018, forest fires near the Lena River cause smoke over the Laptev Sea and East Siberian Sea. CO (see inset) and CO₂ levels that day were as high as 45080 ppb and 724 ppm (at the green circle), as illustrated by the image below. The Copernicus image below shows aerosol forecasts for July 4, 2018, 21:00 UTC, due to biomass burning. 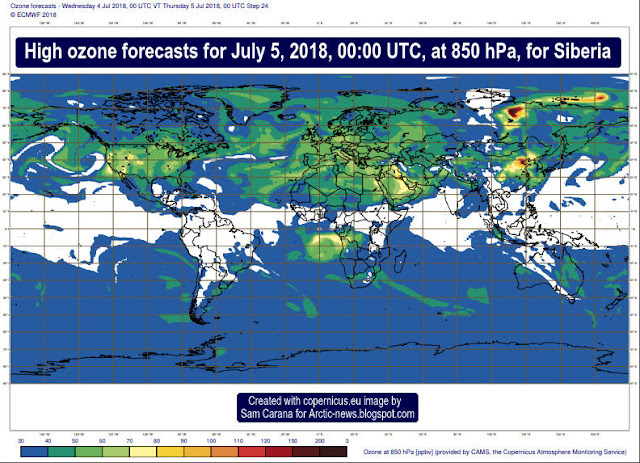 Another Copernicus forecast shows high ozone levels over Siberia and the East Siberian Sea. EPA 8-hour ozone standard is 70 ppb and here's a report on recent U.S. ozone levels. See Wikipedia for more on the strong local and immediate warming impact of ozone and how it also makes vegetation more vulnerable to fires. The global 10-day forecast (GFS) below, run on July 3, 2018, with maximum 2 meter temperature, shows that things may get even worse over the coming week or more. Could we move out of the Danger Zone? What can be done to improve this dire situation? One obvious line of action is to make more effort to reduce emissions that are causing warming. There's no doubt that this can be achieved and has numerous benefits, as described in an earlier post. Emission cuts can be achieved by implementing effective policies to facilitate changes in energy use, in diet and in land use and construction practices, etc. One complication is that the necessary transition away from fossil fuel is unlikely to result in immediate falls in temperatures. This is the case because there will be less sulfur in the atmosphere to reflect sunlight back into space. 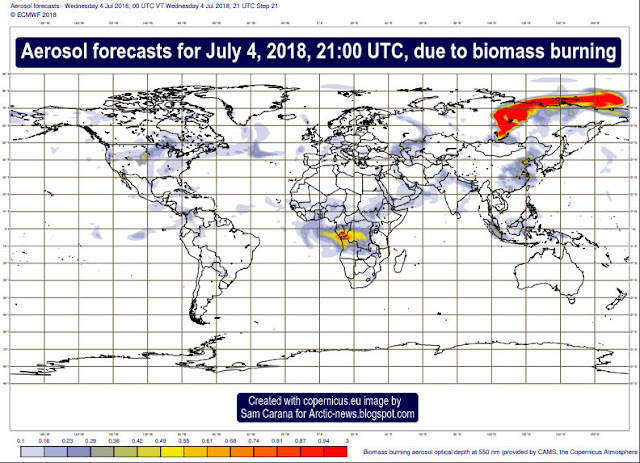 Furthermore, there could also be an increase in biomass burning, as discussed at the Aerosols page, while the full wrath of recent carbon dioxide emissions is yet to come. As said, the resulting rise in temperature threatens to trigger numerous feedbacks that could accelerate the temperature rise even further. For more on how much temperatures could rise, see the Extinction page. While it's clear that - besides emission cuts - further action is necessary, such as removing greenhouse gases from the atmosphere and oceans, the prospect is that such removal will have to continue for decades and decades to come before it can bring greenhouse gases down to safer levels. 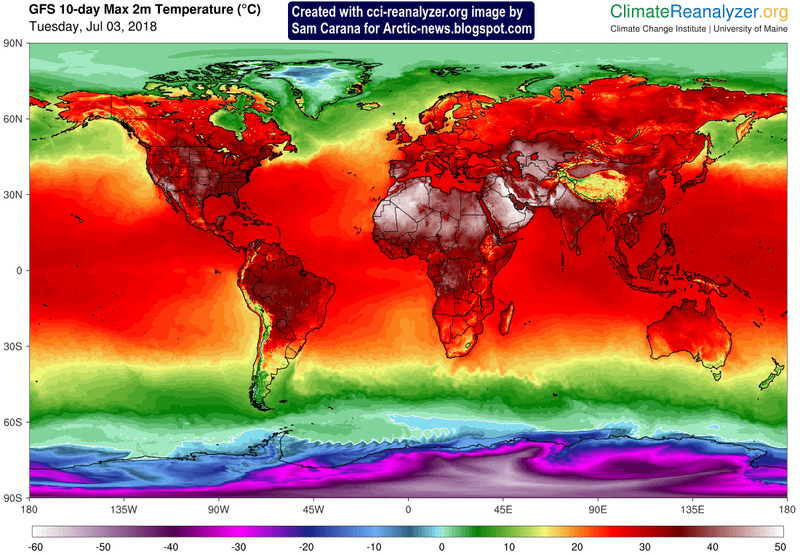 To further combat warming, there are additional lines of action to be looked at, but as long as politicians remain reluctant to even consider pursuing efforts to reduce emissions, we can expect that the world will be in the Danger Zone for a long time to come.